So, my second new cleaning lady actually quit the job before she even started, she said, because she got a full time job. Ok, bravo. Glad we could help you. pitch in which then results in major arguments and name calling (“You are a SLOB”, “You think I’m YOUR MAID”), you realize this could have all been avoided, if at a very young age, this very child was taught, that cleaning their room is like brushing their teeth. No can clean, then no internet access, no hours on the phone, and no hours on Facebook (another bane of my existence and at this point I’d rather her smoke pot than spend the useless hours of name calling and back stabbing and what ever else one does while communicating inane thoughts through the internet…hmmmm, maybe I should go back to therapy). So, after said argument and name calling, the bathroom floor was vacuumed which resulted in me saying, ok, now wipe up all the sticky stuff that is encrusted on your floor from that bottle of Clearasil that broke and is now the flypaper working to catch all your long hairs, lipstick pencil shavings, and that which can not be mentioned in one big pile of crap on your tile. GET ON MY KNEES? LIKE A SERVANT? You are ASKING ME TO GET ON MY KNEES? Well this huge bathroom is about 5 x 5 and could have been cleaned by the time the words got out of her mouth. YES, SLAVE, ON YOUR KNEES. Which resulted in much door banging and clanging and muttered curses under breaths. After some time, Bella decided to take pride in her work, and showed me her newly dusted and vacuumed room, with the bed made, and the clothes put away. WOW, is this really YOUR room? She just smiled and walked out. 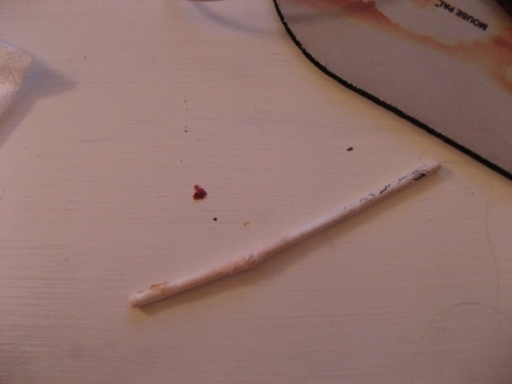 And since I promised to fix her frozen computer, I sat down at her desk, and found, and found the chewed up lollypop stick which had been sitting there for four days, along with other various pieces of schmutz. Yes, I definitely need a new shrink. You are somewhat neurotic. Have you considered prozac?